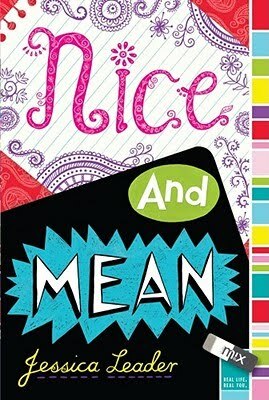 Nice and Mean by Jessica Leader. Grades 4-7. Simon & Schuster Children's, June 2010. Review copy provided by author. 261 pages. Sachi, voted Nicest Girl in last year's school poll. She's risked everything to be in the Video class this year and she can't believe her bad luck in being paired up with Marina. Marina only wants to do things her way and Sachi can see her dream of a provocative documentary about students' attitudes toward different nationalities disappearing into thin air. Can the Nice Girl and the Mean Girl work together to get their project done? Or will it be a total disaster, ending in tragedy for them both? The first thing I noticed when reading this middle-grade debut was the authentic tween voices. Both Marina and Sachi narrate in first-person, alternating chapters in each voice. The characters are totally believable and I definitely bought that they were seventh-graders. While I do wish that Marina's and Sachi's voices had been a little more distinct from each other, that tween voice can be tricky to nail down, and Jessica Leader has done an excellent job. Ms. Leader gets props for including a cast of diverse characters, something you'd expect to see in a New York City middle school. Of our main characters, Marina is white and Sachi is Indian, emigrating with her family when she was five years old. Of their friends and teachers, Asian and African-American characters are included. I really appreciated the thought that went into that. I also appreciated all the details that made the story pop. Marina's thing is fashion and the story's peppered with details about outfits and fashion. I love that it's so NOT done in a designer-name-dropping kind of way, but it's definitely an interest of Marina's. Sachi's interested in fashion too - namely trying to figure out how kids know what's cool and who decides what's "in" and what's "out". Also included are details of the video-making process. Sachi's chapters are preceded by an imagined film scene, while Marina's chapters are preceded by entries in her Little Black Book. Sachi has an interest in making documentary films and we're not only told that, we're shown it throughout the book. Another nice thing about the book is that it's a squeaky clean book about mean girls, popularity, and culture. It's firmly in the middle-grade category. I'd hand it to fans of Peace, Love, & Baby Ducks by Lauren Myracle and Shug by Jenny Han. Check out more reviews at Green Bean Teen Queen, The Book Scout, and Reading in Color, and check out all the posts from Jessica Leader's blog tour! Nice and Mean is on shelves now!